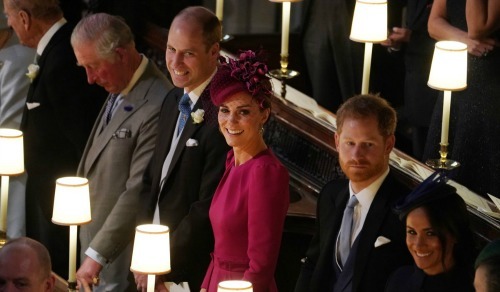 Prince William and Kate Middleton couldn’t help but show a different side of their marriage during Princess Eugenie and Jack Brooksbank’s wedding at St. George’s Chapel on Friday. As a matter of fact, many royal fans and critics noticed that the Duke and Duchess of Cambridge showed a rare public display of affection and it was all caught on camera, too. During their royal engagements and public appearances, Prince William and Kate Middleton are very reserved with one another. Even though they like to joke around once in awhile, they almost never touch one another or even hold each other’s hands in front of the cameras. They also stand very politely and keep whatever passion they have for each other behind closed doors. But at Princess Eugenie’s wedding Kate did something that royal fans have never seen her do as a member of the royal family: she kept her hand placed near William’s inner thigh during the wedding reception. What’s more, William even held her hand during the reception, too. At first, it looked a little awkward considering how far apart William and Kate were sitting, but the Duchess apparently insisted in keeping her hand firmly placed on her husband’s thigh for quite some time. But what Prince William didn’t do was put his hands on Kate Middleton’s lap or continue any of the PDA after that one moment. There’s some speculation that William and Kate held hands simply because Prince Harry and Meghan Markle have been breaking protocol with their public display of affection lately, too. The Duke and Duchess of Sussex often hold hands, touch each other’s backs and make other small gestures to show that they in fact love and like to take care of one another. Prince William and Kate Middleton, however, often look very stiff and distant with one another in comparison. Knowing that Harry and Meghan would most likely look very cozy at the wedding, there’s a good chance that William and Kate’s private moment might have been orchestrated for the cameras, according to some critics. So far Buckingham Palace has not made any comments about the Duke and Duchess of Cambridge’s behavior at the wedding, nor has the palace said anything about Prince Harry and Meghan Markle’s PDA during their royal engagements for that matter, too. In the meantime, don’t forget to check back with CDL for all the latest news and updates from Prince William and Kate Middleton along with the entire royal family right here. Prince William’s Horrified Reaction: Is Kate Middleton Pregnant With Twins?